Upper Deck Pack Attack Events are Coming to Boston! Upper Deck and Sport Images are teaming up for a very exciting promotion in the New England area this February. Eight hobby shops will be hosting an Upper Deck Pack Attack event in their stores where collectors can win some great prizes like Upper Deck t-shirts, Upper Deck sling packs, signed Upper Deck Authenticated mini-sticks and pucks from players like Zach Hamill, Joe Colborne and Taylor Hall and more! Take home autographs of Boston's Colborne, Hamill and Seguin at Upper Deck Pack Attack events throughout New England! The grand prize at each event is an invitation to compete in the Ultimate Pack Attack event where all eight winners will meet up in the Sports Images and Upper Deck suite for the Boston Bruins vs. the Tampa Bay Lightning game on March 3, 2011. There they will compete in a final Pack Attack event for even more prizes like Zack Hamill, Joe Colborne and Tyler Seguin triple-signed mini-sticks, a pair of Tyler Seguin autographed gloves and a NHL Rookie Showcase signed helmet featuring signatures of all the top rookies this season! 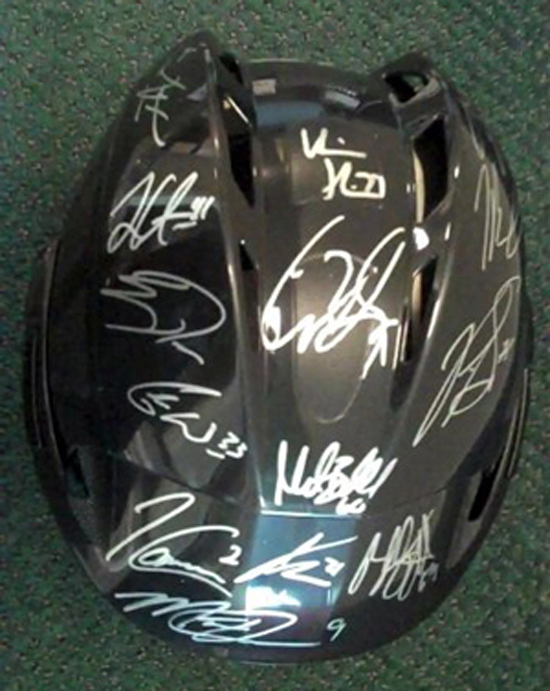 Black Beauty: Collectors can win a helmet like this signed by all the top rookies from this season! Thousands of dollars in prizes are up for grabs. When the puck drops at the TD Garden, will you be there to compete to become the Ultimate Upper Deck Pack Attack Champion? You will have to win a qualifying event to make it there. Here is a list of shops participating in this exciting promotion, don’t miss out! Many thanks to Sports Images and Upper Deck for this great event. I won the chance to compete by winning the event at Bleachers in Abington, Ma. I then went on to win 2 of the mini triple autographed sticks-Joe Colborne, Zach Hamill and Tyler Seguin and then won the Grand Prize-the Pair of Seguin Autographed gloves (the autographed helmet wasn’t there, but I managed to win that at this year’s Bleacher’s event !) y one concern is the gloves did not have a hologrammed COA like the mini sticks and any other certified memorabilia I’ve seen Upper Deck issue. If anyone can’t help me get these authenticated it would be greatly appreciated.